This post is to commemorate March 25, the Fall of Barad-dûr, showcasing jan-u-wine’s poem They All Imagine. In the poem, Frodo recalls the day from the perspective of many years spent in Tol Eressëa. In the scene from which these caps come (fullscreen theatrical version), there is no dialogue. Frodo has already woken up, talked with Gandalf, been greeted by Sam, and introduced to Lord Elrond. 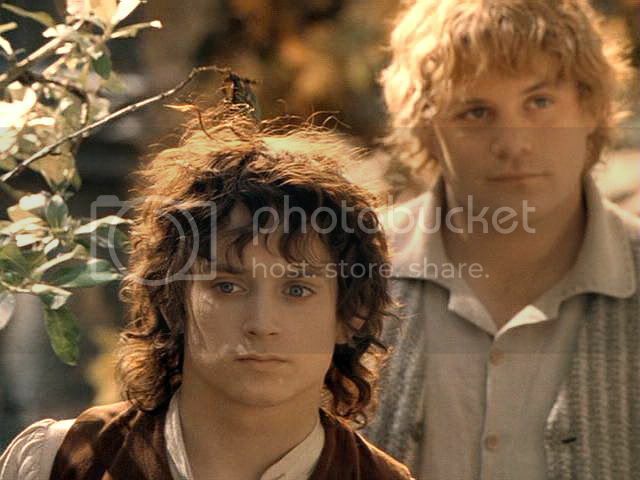 "Welcome to Rivendell, Master Baggins," he says. 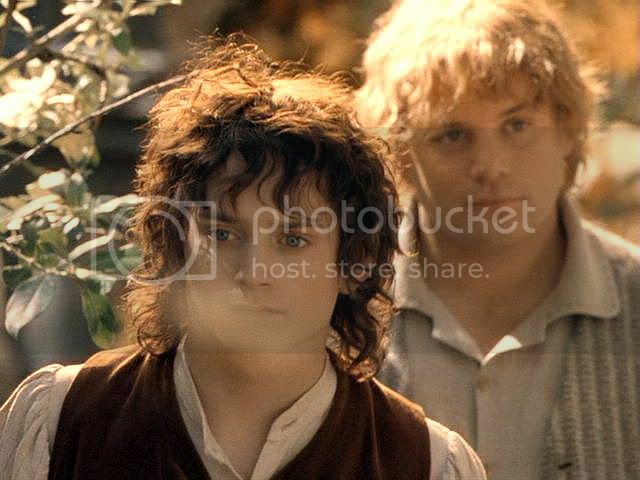 Then the filmmakers show us what Frodo is being welcomed to. 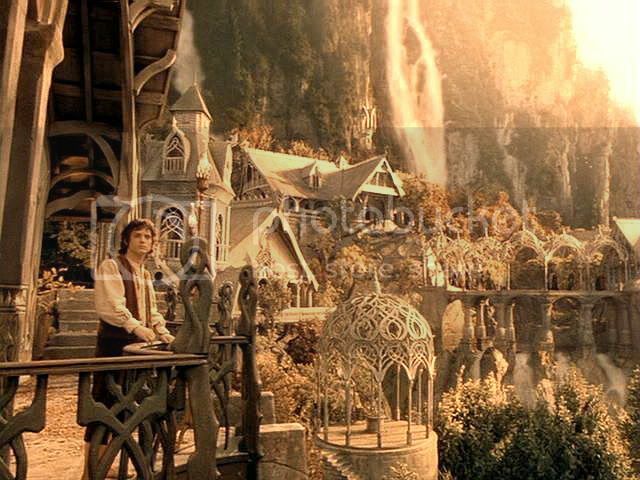 In one of the most glorious moments in Howard Shore's score, the music swells into the first full-blown statement of the Rivendell theme as the viewer is brought into the mountain gorge where the Last Homely House is nestled. Waterfalls—many and varied—first catch the eye as they spill over ledges and foam down clefts. 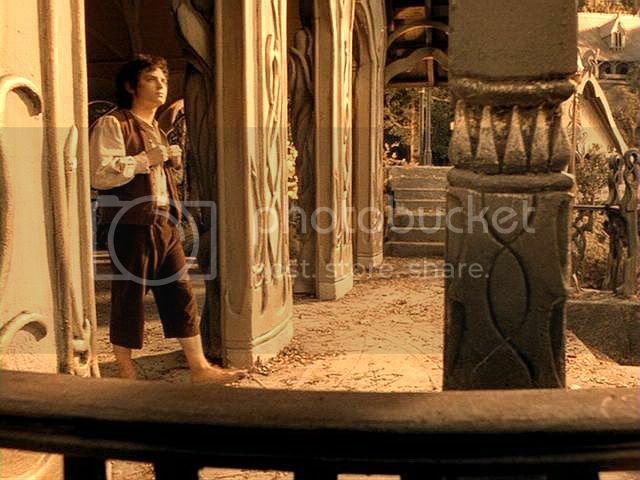 The camera sweeps in nearer, to the edge of a high terrace onto which Frodo Baggins steps. The light is soft and golden. The music is like a sound version of Celtic art. Like the border of a gold-threaded wall hanging, or a page of illuminated manuscript accented with gold leaf, the closely-woven tonal colours twine in a design that is rich and dense, yet shimmery and translucent at the same time. The chords are otherworldly, but the rhythms are natural, building and receding, rising and falling like waves surging and swirling against a sea wall. I find it utterly intoxicating. 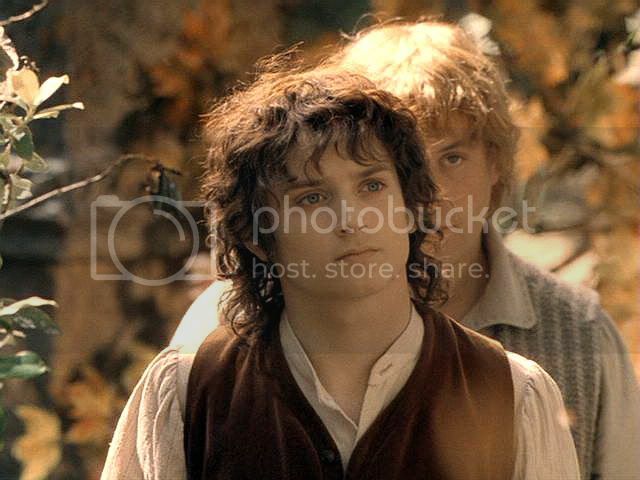 Frodo seems to feel it, too, as he absently buttons his shirt, looking about him, coming to stand at the balcony rail, trying to take it all in. For the purposes of my post, I have put jan-u-wine’s poem directly after the caps on the balcony. 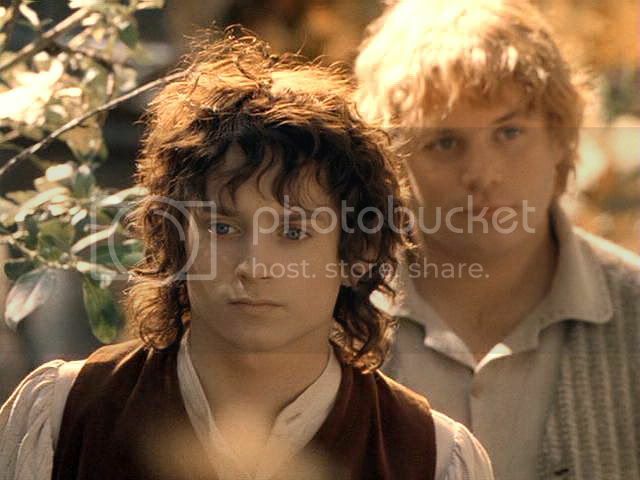 Jan’s poem, as I mentioned, is not set in Rivendell, or even on Middle-earth, but across the Sea on Tol Eressëa, on a March 25th many years after the Quest. 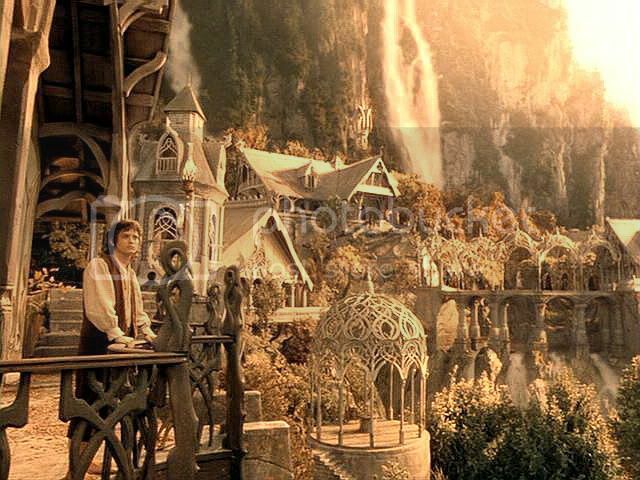 There are no film scenes set in Tol Eressëa, of course, but the film’s depiction of Rivendell—more than its depiction of any other place, including Lórien—evokes for me what that world might be like. The filming, the music, the way the shots are lit, all make magic for me. Jan-u-wine, looking at these caps for the draft, remarked that when she watches the Rivendell scenes she doesn’t feel like she’s watching a movie, she’s there, in the film's world. I said in a post last year that, in terms of mood or "feel", the films turned Rivendell into Lórien. Film-Lorien is a beautiful place, but it is also dark, mysterious, and foreboding, quite unlike the place of deep refreshment depicted in the book. 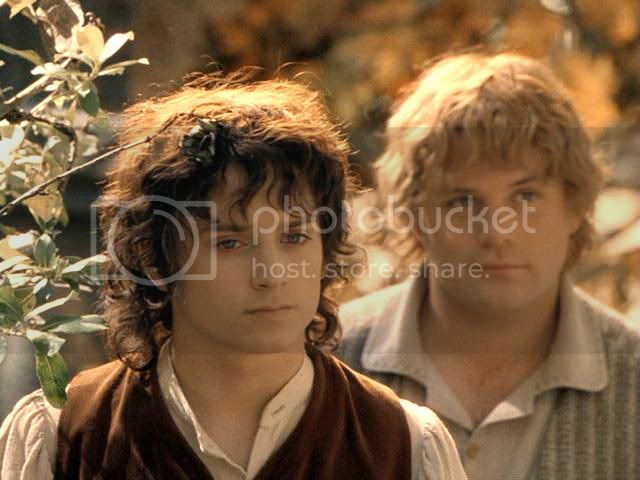 Film-Rivendell, instead, becomes such a place. 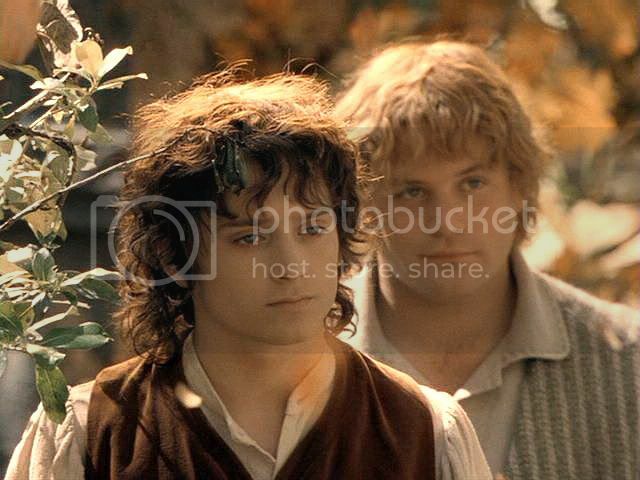 (No wonder Frodo is reluctant to go back home when Sam asks him about it.) 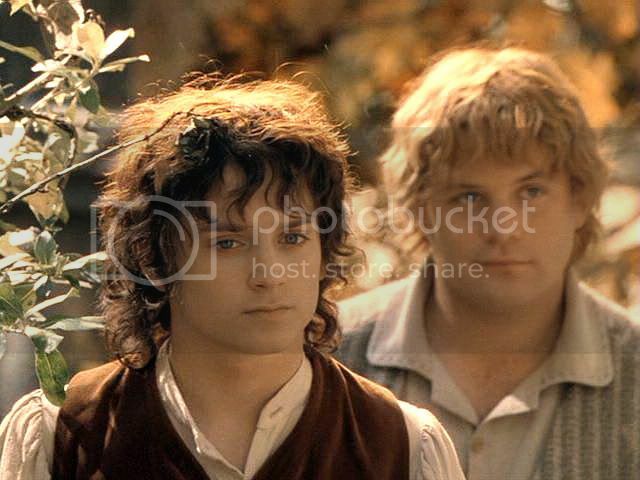 Film-Rivendell, not Lórien, is the place of golden light, where art and nature meet; a place that is timeless yet full of time, ancient yet possessed of a “poignant freshness”. 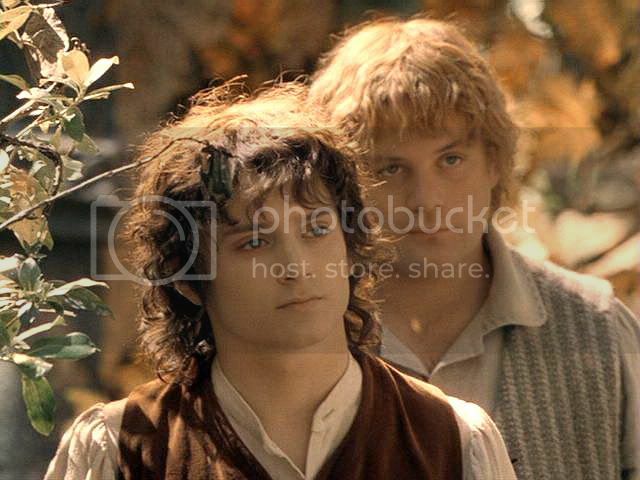 It is in film-Rivendell that viewers are offered a glimpse of what book-Frodo perceives in the Golden Wood: a heightened awareness of the beauty and aliveness of the natural world, and a sense of his place in it. 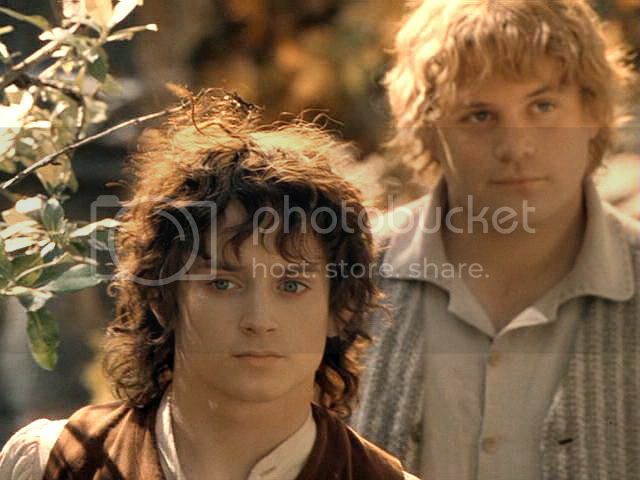 This is what is described in the Lórien chapters. In the film, it happens when he walks out onto the balcony (accompanied by that *amazing* music), and in the scene that immediately follows. 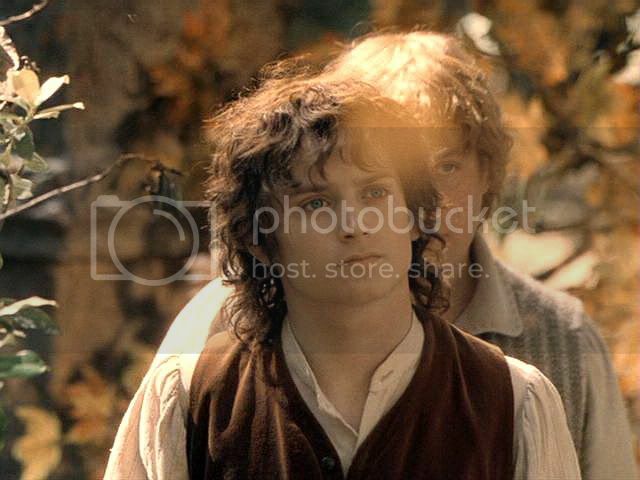 In that scene, he and Sam walk in slow motion through a golden landscape, in golden light, while golden leaves fall like stars around them. 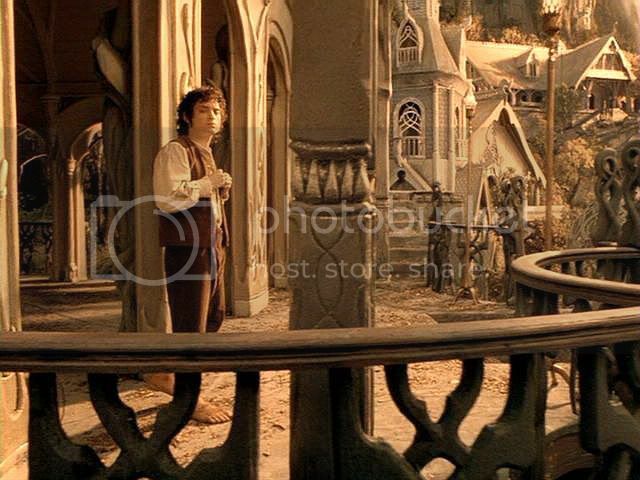 The sequence only last seconds, but that little moment establishes Rivendell as a place in which the hours are truly golden. 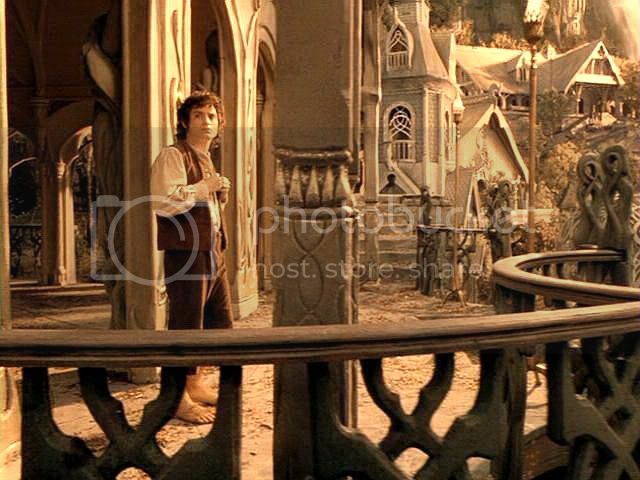 Which is why I chose the “welcome to Rivendell” screencaps for jan-u-wine’s poem. 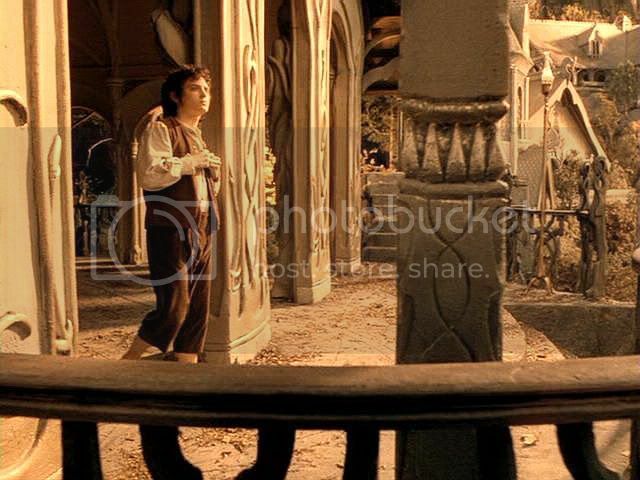 Of all the scenes in the three films, I think this sequence gives the best sense of what the Undying Lands would be like for Frodo, visually, and as an experience. 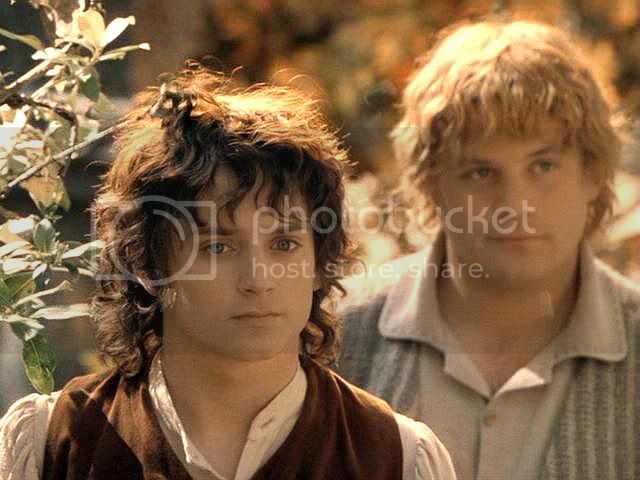 Because in Jan’s poem Sam has not yet arrived in Tol Eressëa, I put the caps of Sam and Frodo walking after the poem. In my mind, the images give a sense of them enjoying together the bliss and peace of Eldamar, with many years (I hope) of golden hours, rich with joy and quiet beauty, before the time when they would pass beyond the Circles of the World. that I do not remember. runs its lash through me…. lies almost in silver clouds. Its gentle pull leads me back to myself. 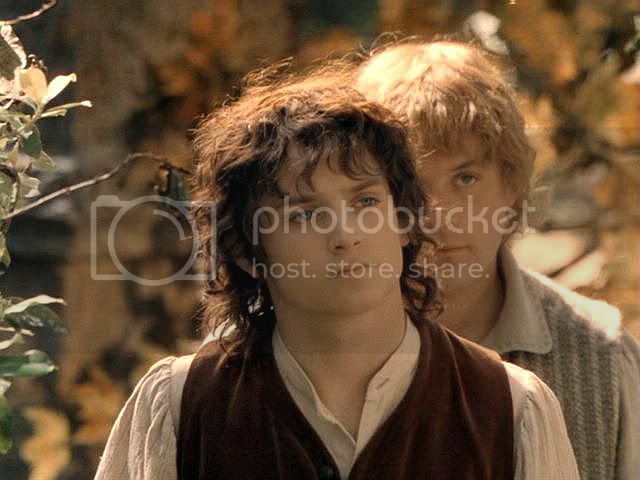 ~ jan-u-wine's "Frodo's Journal", posted to commemorate March 25, 2007, with screencaps from the fall of Barad-dûr. 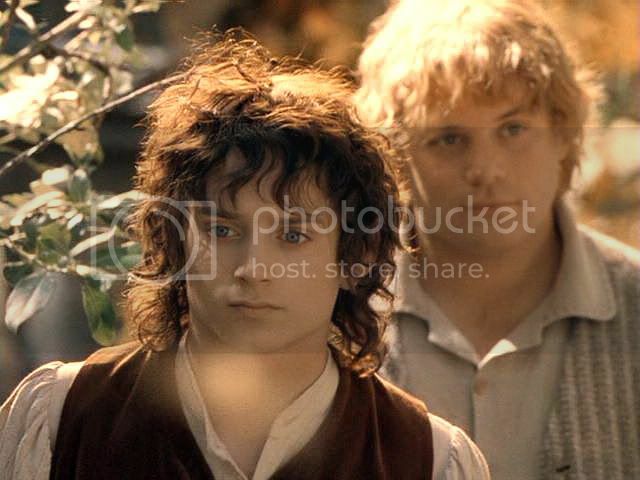 ~ "Not So Easily Mended" by jan-u-wine (after Frodo has sailed, Sam reflects in Bag End), screencaps from Sam's rescue from the Anduin. ~ “Across So Wide a Sea” by jan-u-wine (Sam arrives in Tol Eressëa), painting by Nanette-Rosie Gagnon. "There are no film scenes set in Tol Eressëa"
I believe there is quite a lot of fic set in the Undying Lands. I wonder how much of it, if only subliminally, was inspired by this sequence? I think March 25 is a "feast day" for Tolkien lovers. 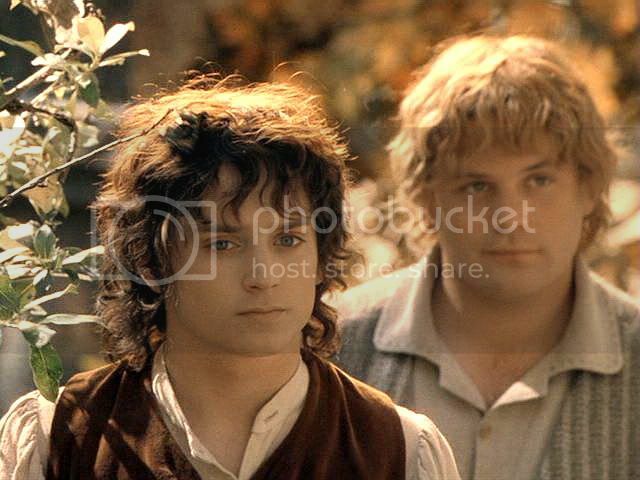 It would be neat to have a Tolkien calendar marked with the feast days. Maybe I should make one (probably, someone already has). 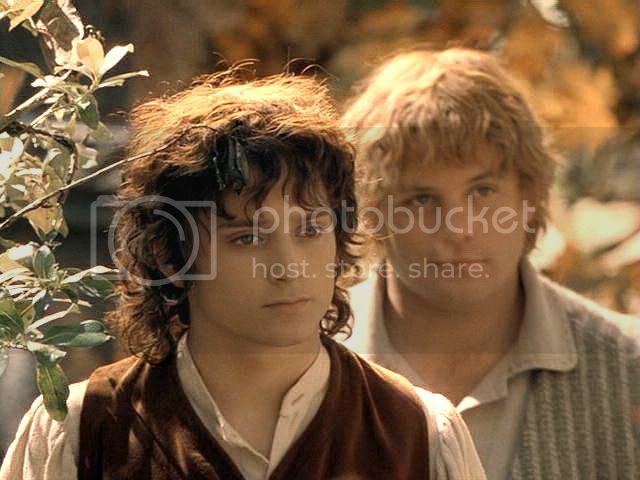 You know, one that notes the important events of the War of the Ring, the birthdays of participants that are known -- that sort of thing. I'd love something like that. Thanks, Hadara. Gosh, that's a moving icon. Oh, to know his thoughts in this second set of pictures. And I don't know why... but I love the leaf that brushes through his hair. It somehow has always made that scene more poignant for me although I could not tell why. I absolutely love the last screencaps. It's a wonderful scene, a tender moment shared between friends, when no words are needed. I love the golden glow and the sense of peace that transpires through those pics. The poem is really touching! 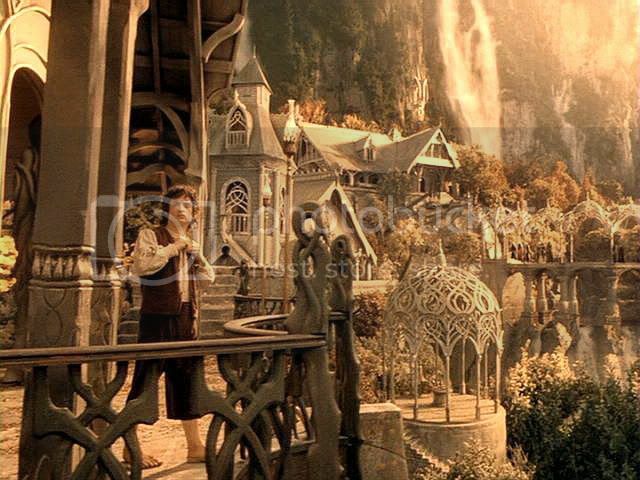 I think it's true that Film-Rivendell is depicted as the cradle of peace and art and hope. 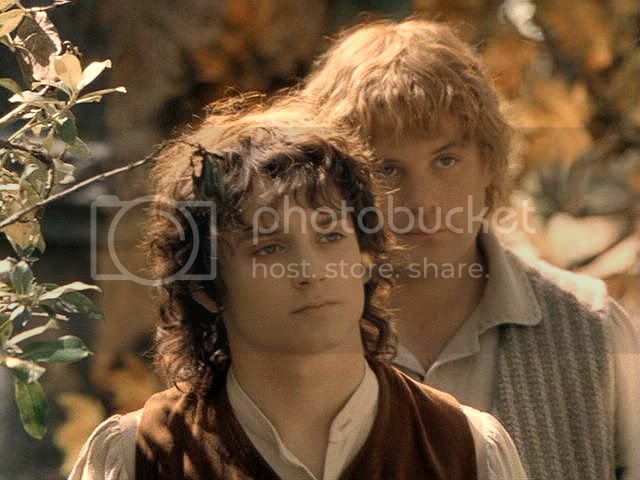 Film-Lorien, being nearer Sauron's power, was an ambivalent place. I always pause before coming in here, the way you would before entering an art gallery. I know that I will be invited not just to see something, but to feel something, and I have to prepare myself. It is fascinating to me that moments I think I have experienced richly still have so many undiscovered layers which you are kind enough to uncover so gently through the careful juxtaposition of screencaps and words. Watching these moments in still images is like seeing slowed down footage of a hummingbird's wings, allowing you to see the true grace and beauty. Jan's beautiful poem left me with somewhat of an ache, at first, as it seemed to imply that Tol Eressea is not the haven of total peace and healing I had imagined, and that dark memories and unsatisfied desires still haunted Frodo even here. 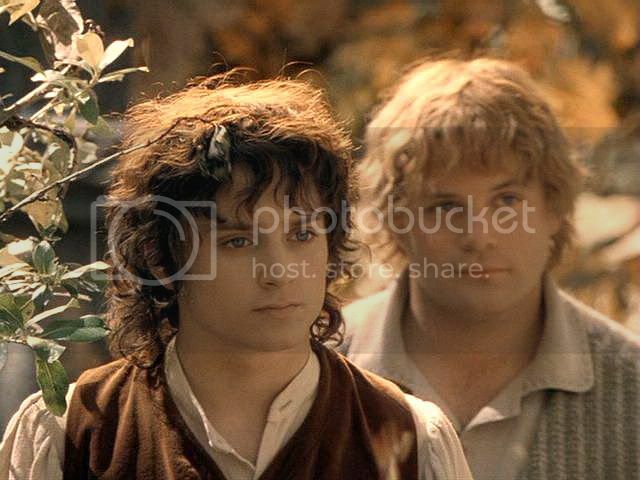 On a second reading, I felt that the terrible almost-memory seemed to throb and then recede, like the sound of the waves, and that the Elven-song and natural beauty enfolded him once again. It leaves me feeling that peace would not be possible without utter forgetfulness, but that rememberance is part of identity. Even vanquished evil leaves a trace and Frodo's decision to remain alive, though exiled, is part of his courage to endure the taint of evil and keep it far from those he loves, even in his own person. Thank you both, as ever, for a beautiful and thoughtful experience.